MotoXross brings you extreme physics based motocross racing at its finest. Record and race against your ghost. Finish line shows your track time and the ghosts track time. ✔ Game Center Leaderboards & Achievements. Choose from the Accelerometer tilt control or two other touch control schemes to control the gas, break, and balance of the motor bike. 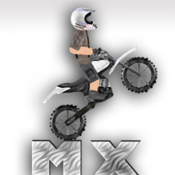 Optionally disable the music that comes with MotoXross and play your own music while racing and unlocking Game Center Achievements. This version comes with the 10 Muga's Peak race tracks and the 10 Death Canyon race tracks. The Okonoko Sky 10-track pack can optionally be added as an In App purchase.